Are you the kind of person who only purchases gasoline and neither pays for nor consumes any other goods? If so, we have excellent news for you today: gas prices in 2013 are expected to decline, even though the cost of just about everything else is going up. The AP reports that hamburger meat, taxes and health care costs are set to increase this year, but gas prices are supposed to drop a whopping five percent to an average of $3.44 per gallon. Still not super cheap, but we'll take it, right? Forecasters say ample oil supplies and weak U.S. demand will keep a lid on prices. The lows will be lower and the highs won't be so high compared with a year ago. 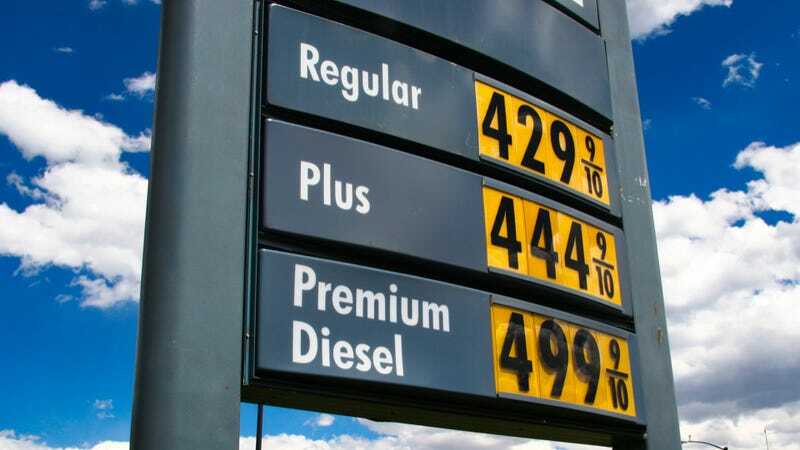 The average price of a gallon of gasoline will fall 5 percent to $3.44, according to the Energy Department. Now, these prices are still among the highest ever, but the drops mean that the average American household could save as much as $205 thanks to the drop. You could buy a short shifter or even some sway bars with that kind of cash. What will you do with all the money you'll (supposedly) save on gas this year?